This example shows some effects of changing particle swarm options. Often, particleswarm finds a good solution when using its default options. For example, it optimizes rastriginsfcn well with the default options. This function has many local minima, and a global minimum of 0 at the point [0,0]. particleswarm reached the value 0.000000 using 2560 function evaluations. For this function, you know the optimal objective value, so you know that the solver found it. But what if you do not know the solution? One way to evaluate the solution quality is to rerun the solver. particleswarm reached the value 0.000000 using 1480 function evaluations. 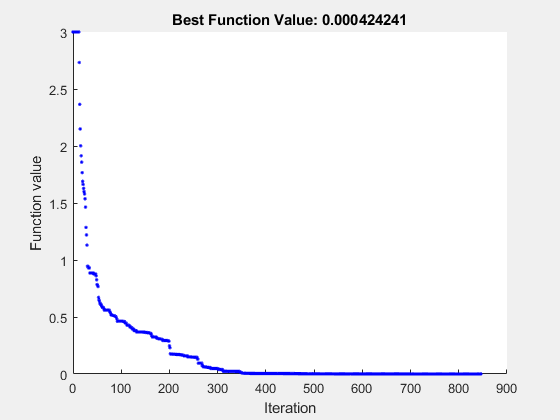 Both the solution and the number of function evaluations are similar to the previous run. This suggests that the solver is not having difficulty arriving at a solution. The Rosenbrock function is well known to be a difficult function to optimize. This example uses a multidimensional version of the Rosenbrock function. The function has a minimum value of 0 at the point [1,1,1,...]. particleswarm reached the value 3106.436648 using 12960 function evaluations. The solver did not find a very good solution. Try bounding the space to help the solver locate a good point. particleswarm reached the value 0.000006 using 71160 function evaluations. The solver found a much better solution. But it took a very large number of function evaluations to do so. Perhaps the solver would converge faster if it paid more attention to the best neighbor in the entire space, rather than some smaller neighborhood. particleswarm reached the value 0.000462 using 30180 function evaluations. While the solver took fewer function evaluations, it is unclear if this was due to randomness or to a better option setting. Perhaps you should raise the SelfAdjustmentWeight option. particleswarm reached the value 0.000074 using 18780 function evaluations. This time particleswarm took even fewer function evaluations. Is this improvement due to randomness, or are the option settings really worthwhile? Rerun the solver and look at the number of function evaluations. particleswarm reached the value 0.157026 using 53040 function evaluations. This time the number of function evaluations increased. Apparently, this SelfAdjustmentWeight setting does not necessarily improve performance. Perhaps particleswarm would do better if it started from a known point that is not too far from the solution. Try the origin. Give a few individuals at the same initial point. Their random velocities ensure that they do not remain together. particleswarm reached the value 0.039015 using 32100 function evaluations. The number of function evaluations decreased again. The multirosenbrock function allows for vectorized function evaluation. This means that it can simultaneously evaluate the objective function for all particles in the swarm. This usually speeds up the solver considerably. Elapsed time is 0.616201 seconds. Elapsed time is 1.073579 seconds. The vectorized calculation took about half the time of the serial calculation. You can view the progress of the solver using a plot function. particleswarm reached the value 0.079755 using 24960 function evaluations. Frequently, using more particles obtains a more accurate solution. particleswarm reached the value 0.000424 using 169400 function evaluations. particleswarm can search through several basins of attraction to arrive at a good local solution. Sometimes, though, it does not arrive at a sufficiently accurate local minimum. Try improving the final answer by specifying a hybrid function that runs after the particle swarm algorithm stops. Reset the number of particles to their original value, 60, to see the difference the hybrid function makes. particleswarm reached the value 0.000000 using 25191 function evaluations. 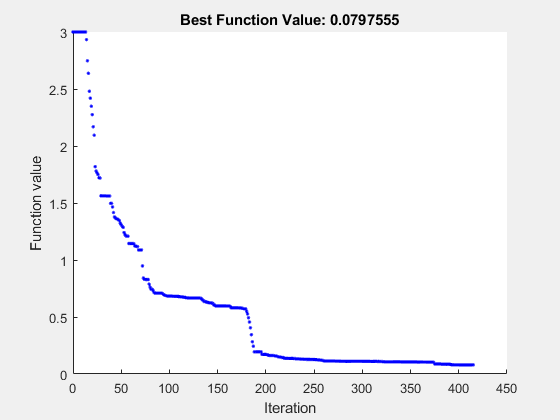 While the hybrid function improved the result, the plot function shows the same final value as before. This is because the plot function shows only the particle swarm algorithm iterations, and not the hybrid function calculations. The hybrid function caused the final function value to be very close to the true minimum value of 0.